Spine-cheek clownfish (Premnas biaculeatus), also known as tomato clownfish, get their name from their vibrant red-orange hue and bold black-and-white color strokes, which resemble the face paint of a circus clown. 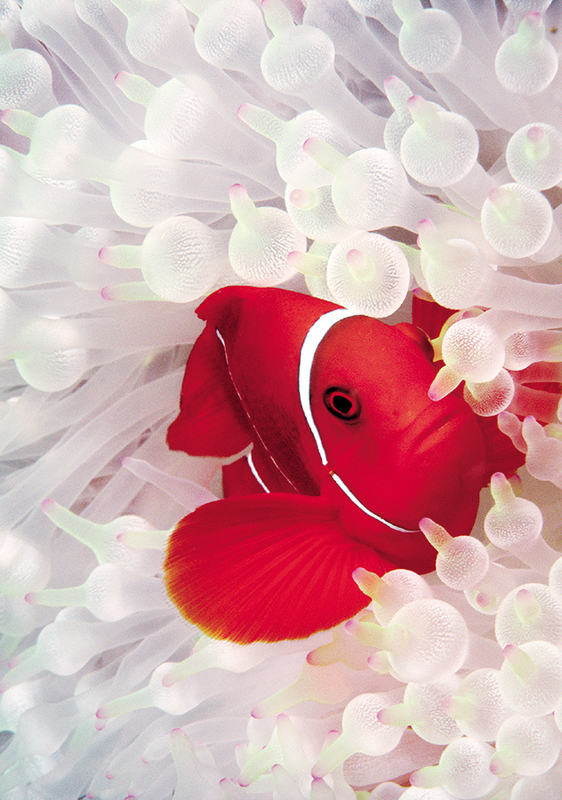 This species of clownfish lives and lays its eggs among the tentacles of the bubble-tip sea anemone (Entacmaea quadricolor). Both organisms form a symbiotic relationship: the clownfish will rarely stray more than a few yards from its stinging tent of protection, and the anemone benefits from the darting antics of the clownfish, which protect it from anemone-eating predators.